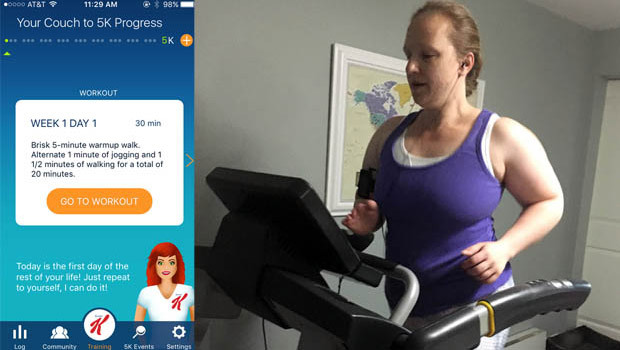 Follow writer, mom and everyday person Meredith Bland as she trains for her first 5K using the Couch to 5K® presented by Special K mobile app. Read the first installment here. I just finished my first three weeks of the Couch to 5K® presented by Special K training program, and I've already had an obstacle to overcome and a success to celebrate—and I finally learned all the words to Nicki Minaj's rap in the song "Monster." As I said in my first installment, I started this program in "okay" shape, so week one, a mix of short bouts of walking and running, was actually a breeze. I was even dancing on the treadmill (I'm very lucky I didn’t hurt myself…that would have been difficult to explain). But then came week two. On my Monday run, I felt a sharp pain on the outside of my left ankle that traveled all the way up my left calf. The strange thing about it was that when I ran, it didn't hurt at all. But when I slowed down to a walk, it felt awful. Many new runners struggle with some initial aches and pains. Luckily, I have a doctor in the family who was able to point me in the right direction: stretching my calves. I also, after consulting Dr. Google, decided to put aside the brand new running shoes I bought just for this program and go back to my much-loved, comfy, feel-like-I'm-floating-on-air sneakers. So before my next run, I changed the schedule up a bit. I did a five-minute warm-up walk, then I got off the treadmill and stretched my calves for—not kidding—about 20 minutes. Man, did I stretch my calves. Those calves didn't even know what was coming. Then I got back on the treadmill and did another five-minute brisk warm-up walk. Thankfully, doing that before each run seems to have done the trick, and I haven't had any pain since.